In fact, it's been a long time since prunes were popular in any configuration. When I was growing up, only senior citizens ate prunes. I knew of no one younger than 60 that ate them. One elderly neighbour lady introduced me to these things. They tasted gross to me. She went on and on about how much she always ate prunes in her youth. I guess that's why they called it "The Depression". So I don't think many younger folks even know what they are today. I never liked them personally (just the name "prune" conjures up nursing home kitchen fodder) and I don't see them in many stores these days. Once in a while, maybe. Post Bran & Prune Flakes was truly a "grown-up" product of it's time. No crazy mascots, awesome prizes or flavour gimmickry in these boxes. Just a plain, middle of the road cereal for middle age and older. 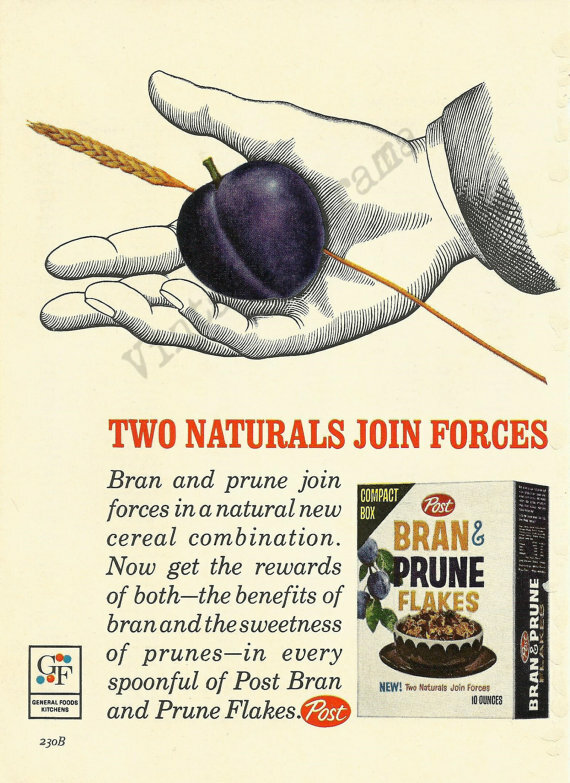 Introduced in the late 1950s, Post Bran & Prune Flakes were popular with the Geritol crowd during the '60s. But sales began sliding off by the latter half of the decade. They were discontinued in 1972.